Link's family of auxiliary suspensions weighs in at approximately 6 percent less than comparable 8K, 10K, 13.5K and 20K self-steer axles. 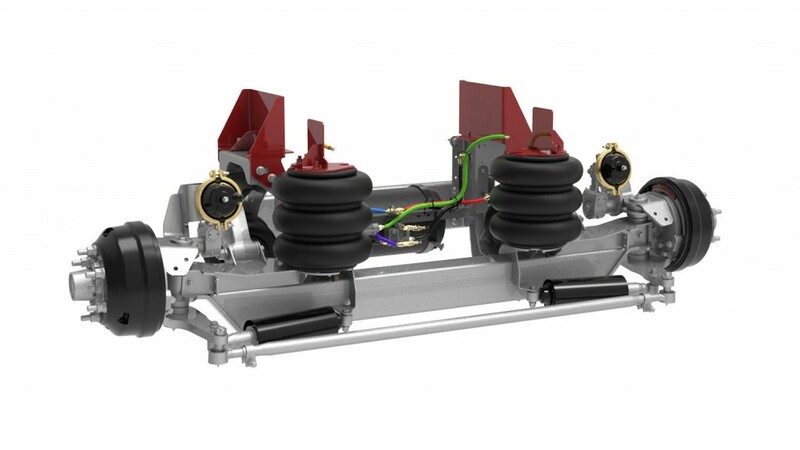 Link's family of 8K, 10K, 13.5K and 20K self-steer auxiliary suspensions features its revolutionary Swift Mount technology, allowing installation to be completed in as little as two hours, compared to between six and eight hours for competing systems. Link's patented Swift Mount interchangeable ride height brackets incorporate improvements in the way the frame brackets attach to the suspension hanger. The brackets can be used to mount any Link suspension, and by maintaining four sets in inventory, installers can be prepared for nearly any installation. Link's Swift Mount design uses a unique stepped-edge on the frame bracket, offering installers a visual indicator to help center the suspension on the truck. By simply comparing the frame bracket-to-hanger location for both the driver and passenger sides, the suspension is easily centered, greatly reducing installation times. Rear air spring brackets are compatible with wide flange frame rails, accomplished by having the air fittings oriented to the outside. The air fittings can also be repositioned to the inside if desired. For ease of service later, the air springs can be removed and replaced without needing to remove the bracket from the truck. An optional bulkhead air control system is also available, fitting within each axle's compact mounting envelope. All air fittings are push-to-connect, and air tanks are designed to mount slightly above cross members, protecting them in cases where the suspension bottoms out. "We listened to the marketplace and responded by adding compelling features to our existing family of self-steer auxiliary suspensions, along with unparalleled installation and performance advantages," said Jim Huls, president of Link Manufacturing. "Their structural durability, corrosion resistance and standardization characteristics will impress bodybuilders, fleets and drivers alike." All Link self-steer auxiliary suspensions are equipped with rugged cast lift arms and Link-KOAT migratory self-healing metal treatment. With its unique characteristics, Link-KOAT provides unparalleled corrosion resistance and rust protection, even when surfaces are exposed to excessive abrasion, harsh chemicals and other severe-duty environmental factors. The 8K and 10K members of the auxiliary suspension family share the same hardware and are designed for more robust performance than competitors, and feature heavy-duty bearings. To support its broad range of applications, Link's 13.5K suspension with optional premium disc brake package will be available in April 2019. Link's family of auxiliary suspensions weighs in at approximately 6 percent less than comparable 8K, 10K, 13.5K and 20K self-steer axles. Link also integrates industry-standard wheel end and brake components into its suspensions, boosting uptime by streamlining maintenance processes and inventory overhead. "At Link, our legacy of building reliable, durable and intelligently designed suspensions continues to attract broad industry attention and further market penetration," Huls said. "We are structured to meet growing demand, while remaining nimble and able to respond to customer orders with rapid shipping times and ultra-responsive customer support. We're proud of what we're building and what we've built." To ensure critical delivery timetables, Link recommends allowing a five-day lead time for product delivery when possible. Customers may ask about accelerated shipping times when ordering.